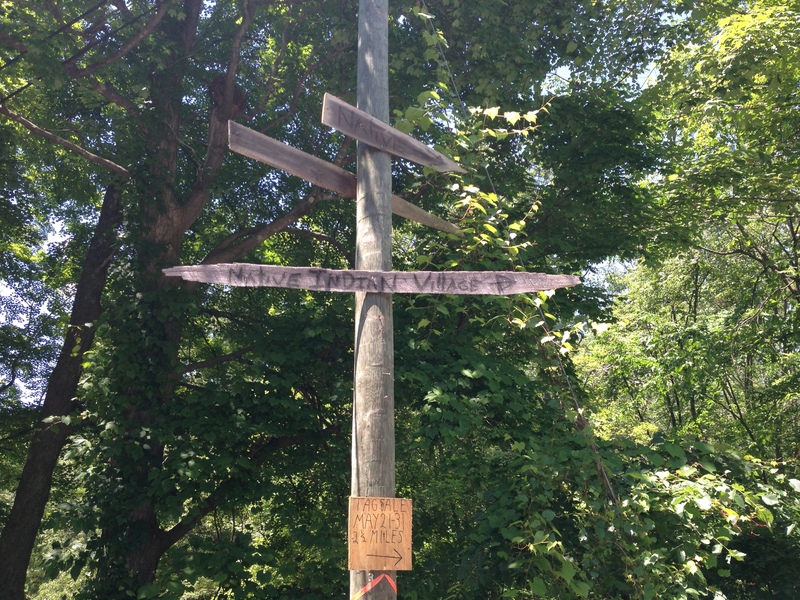 On the Appalachian Trail everyone takes a trail name. For the thru-hikers this becomes an identity that grows as they make their northward progress from Georgia to Maine. My trail name is “Dirty Rice” and Brendan went by the name “Wet Whistle”. Day 2 was a long but good hike. 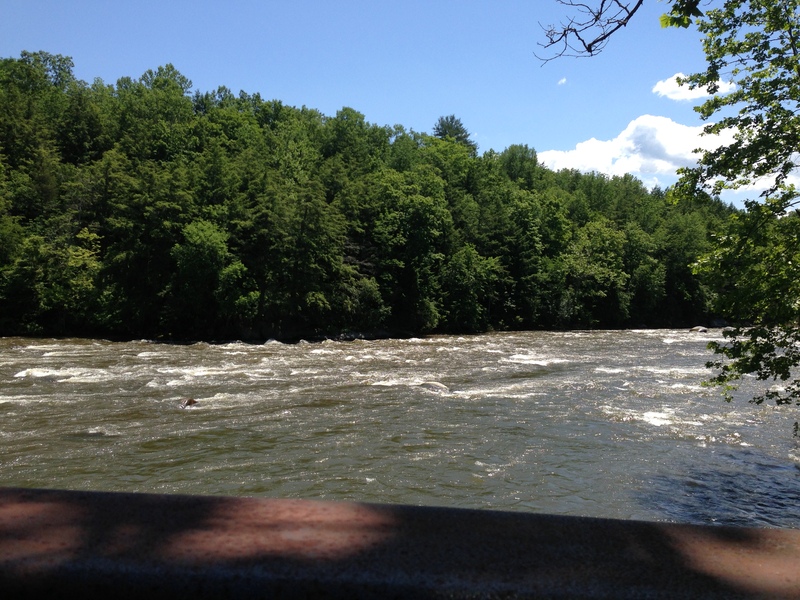 We did 10 miles that day and it included a number of highlights such as the spot where the Ten Mile River meets the Housatonic. After crossing small streams all day to see an actual river with mad rushing currents was exciting! After crossing small creeks all day, this was a major river with swift angry currents! Along the way we stopped at a shelter for a lunch break. Ten Mile Shelter was a pleasant spot in a small meadow and there we met Wolf Shadow and Crazy Legs. They had been hiking from Georgia since the end of January! 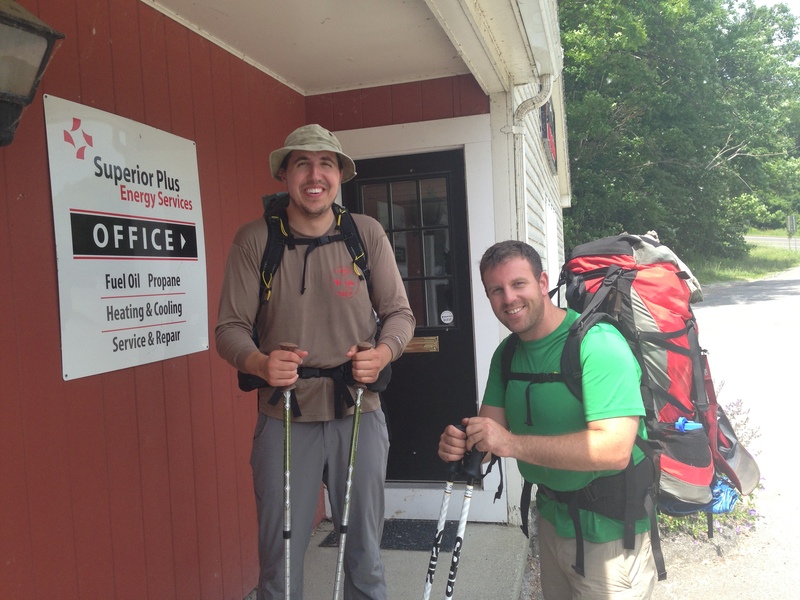 They had seen a lot of winter hiking and were taking their time (most thru-hikers begin in late March) and were stopping in small towns and keeping reasonable mileage goals each day. This was contrasted by Jericho who passed us on the trail like a sports car. He started on March 31st and was roaring past us in an effort to clear Connecticut in two days…a goal for which we set aside 6 days! All of the through-hikers had a certain profile. They travel extremely light, many wearing light footwear such as sandals, and they hike very fast. 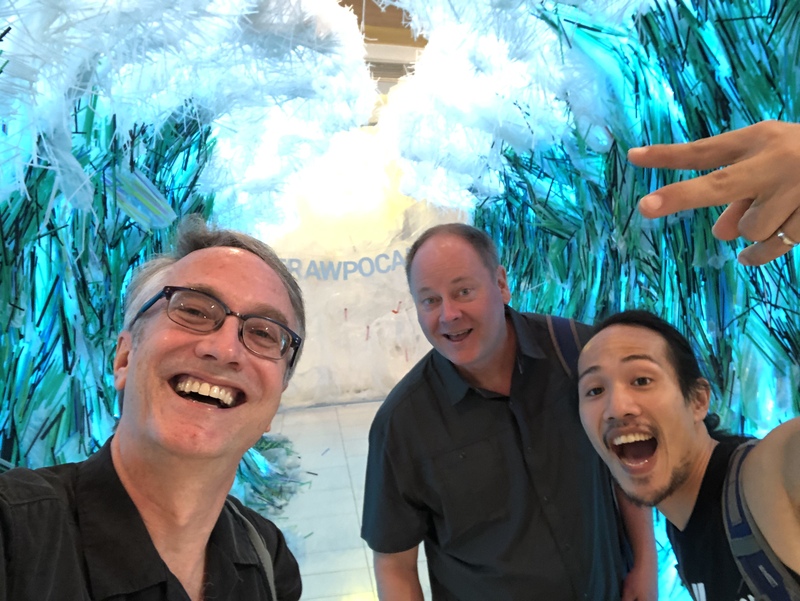 If you saw the picture in the previous post you know that Brendan and I could have stood to skip a meal here and there but these guys were lean and wiry, every last one of them. Consequently, nobody was asking us if we were up from Georgia! 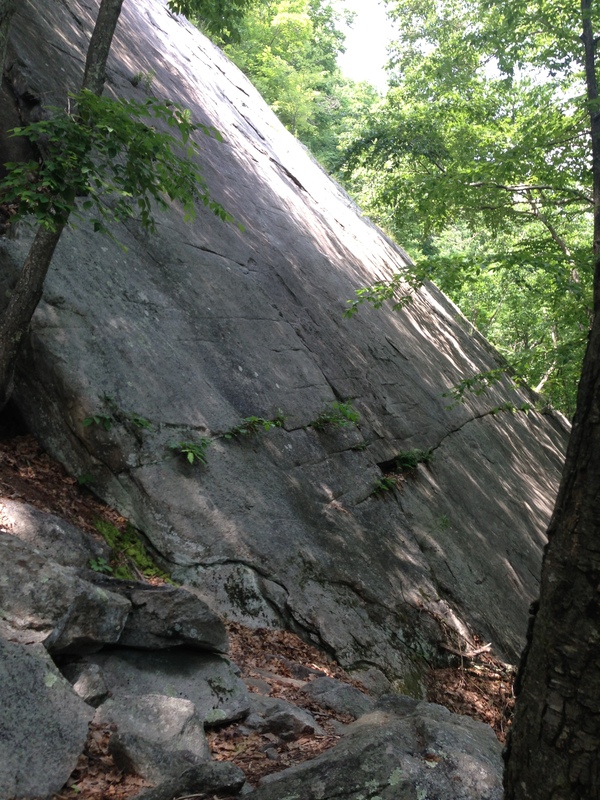 The CT portion of the AT has some unique features. For example we entered the only Indian Reservation through which the AT passes. 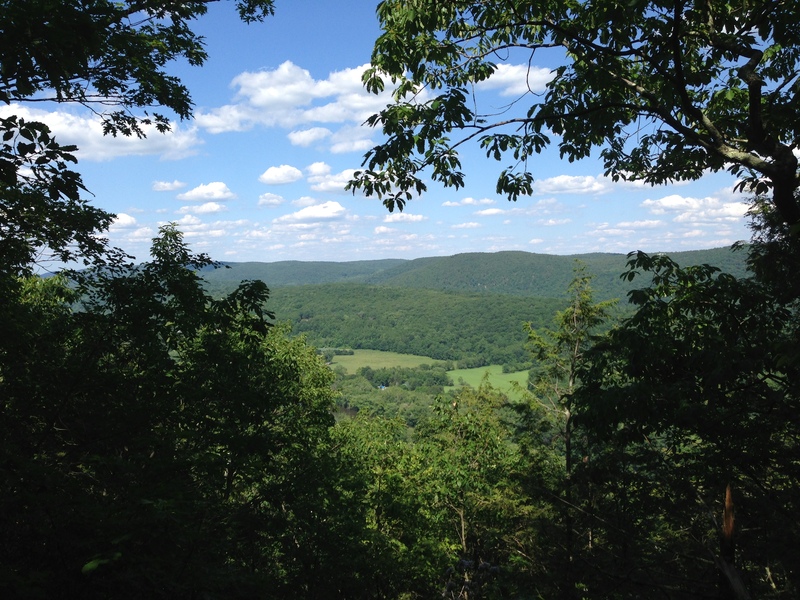 The Schaghticoke Indian Reservation was a rugged mountain area that we entered right after crossing Ten Mile River. They own about 400 acres. It was a long steep climb that required frequent breaks for water and a bite of something. It seemed like it would never stop going up and just as you thought you were cresting the summit you would find that it was a “false summit” and there was plenty more beyond that! Long hard climbs were always rewarded with fantastic overlooks! 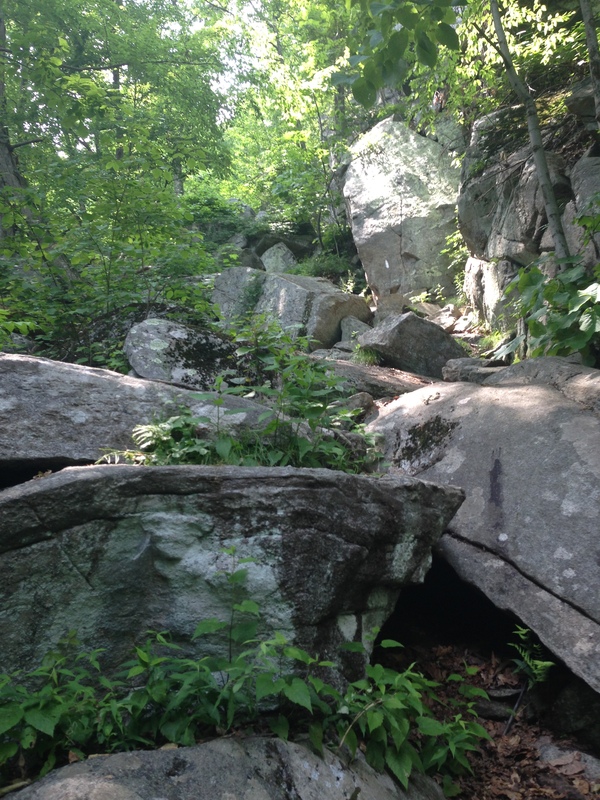 It turned out the climb was up the Schaghticoke Mountain and we made it to a locally famous spot called Indian Rock. Now we knew it was just a short trip down the hill a bit to our campsite. 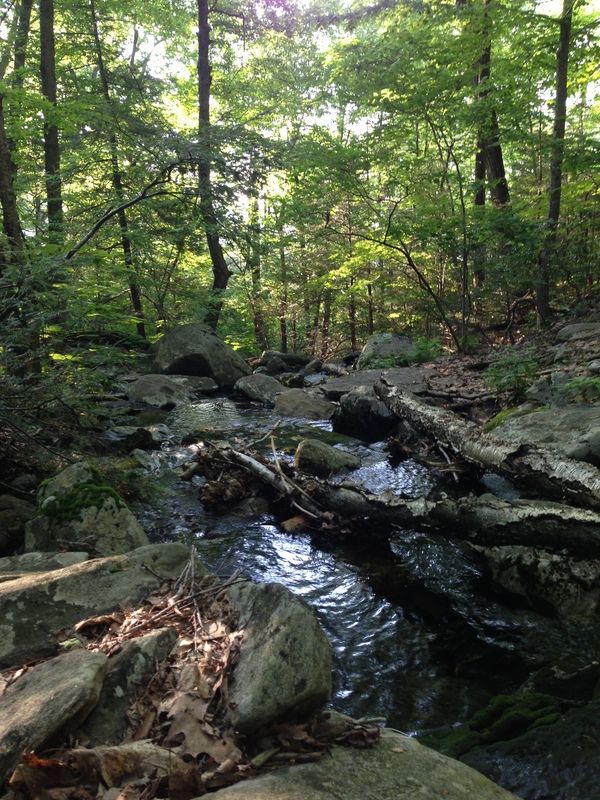 The Schaghticoke Mountain Campsite was a charming little spot in the woods with a loud babbling brook running by, no serious mosquitoes, and no other campers. We had the place to ourselves. This icy cold mountain spring was the best therapy my feet could have received! The first thing we did was get our shoes and socks off and soak our aching feet in the icy cold stream! It was therapeutic and I think my foot size returned to the normal size! We got dinner going. As we hiked that day, we began discussing dinner early on. The decision was curried lentils with chicken. This would turn out to be the best meal of the week in my opinion. I cut up a scallion, a chili pepper, and a clove of garlic and sautéed them in oil before adding the lentils and the sauce mix. To that I added water and simmered while we bathed in the stream and washed our clothes. The foil pouch of chicken was already cooked and got added at the very end. 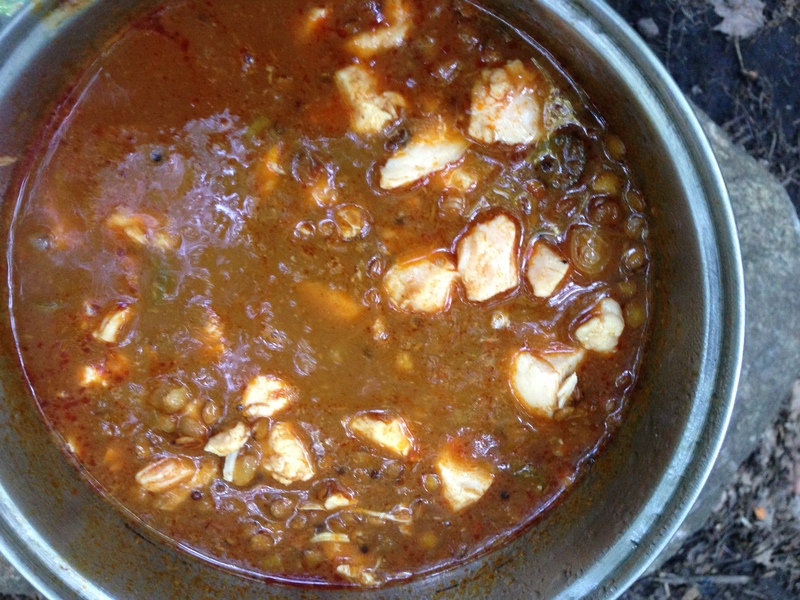 Madras curried lentils with chicken – our best meal of the week! Refreshed, somewhat clean, and starving we feasted on those lentils like it was the first time we’d eaten in weeks! They were spicy and lively on the palate and made for such a bright spot in what had been a long day of hiking! Brendan had brought along a small flask of Woodford Reserve Bourbon and that night we began the evening ritual of a “thimble” of bourbon while dinner was cooking. It seemed so civilized to be enjoying some semblance of cocktail hour out here in the woods! This noisy brook near our campsite would drown out all the other noises in the woods. Turns out white noise in the woods is good for a night’s sleep! The hike had been long but good. No blisters, no real problems other than sore feet, and we would be ready to do another 10 miles tomorrow. Food hung out of bears’ reach, laundry drying on the line, today had been a good day and we were waiting for the sun to go down so we could go to bed! We awoke the next day having slept a little better than the night before. This would be the case each night. 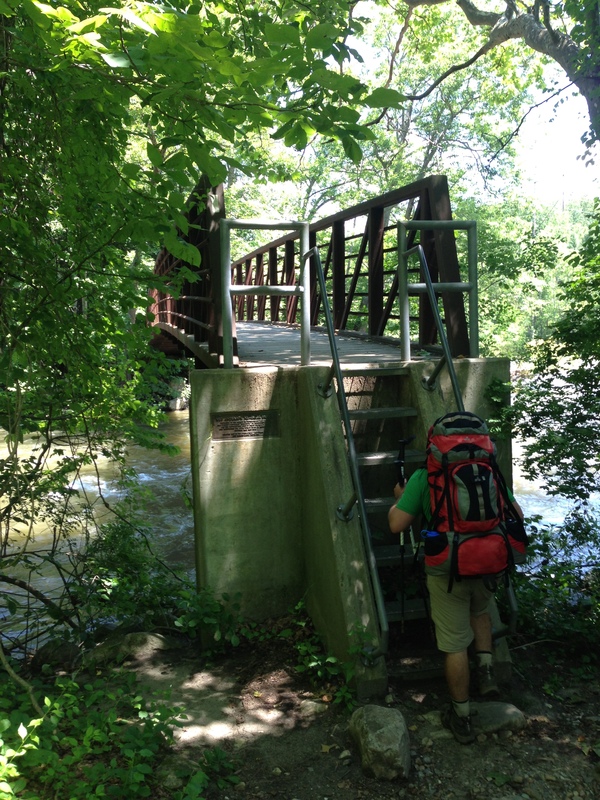 We were excited for the day because Connecticut hosts the longest level stretch of the entire 2100 miles of Appalachian Trail, 4 miles along the Housatonic River and our day would end in the middle of it. So the day would end with 2 level miles and the next day would begin with 2 level miles. 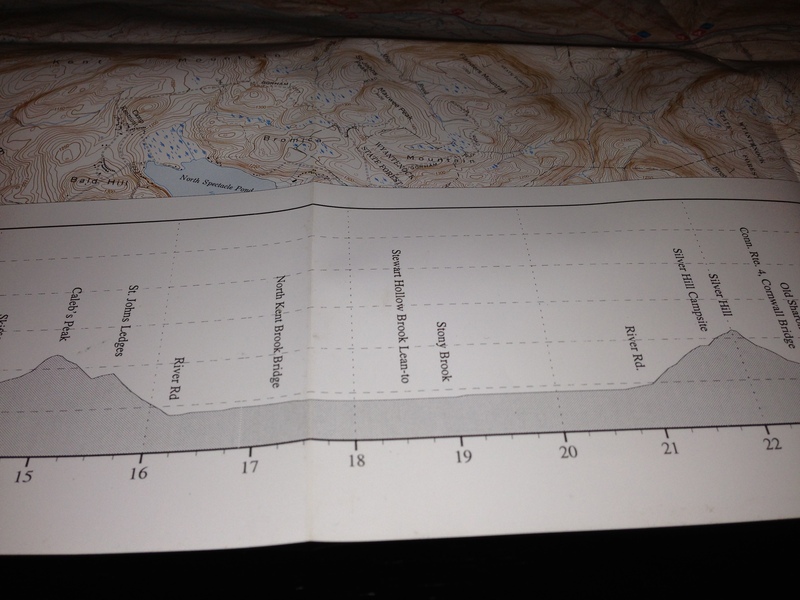 Looking at the elevation on the map it looked so beautiful! We were excited that the day would end (and the next one begin) on this long level stretch of trail. Our campsite was the Stewart Hollow Brook Lean-To, roughly in the mid-point. But first we had to hike some mountains! We started at the Schaghticoke Mountain Campsite (mile marker 8.5 on this map) and had to go to Stewart Hollow Brook, mile marker 18.5. We set out and immediately tackled Mt. Algo. I was again surprised at how well a night’s sleep can restore the body. We were nervous because we had greatly underestimated how much bug spray we would need and already we were out! We considered a trip into Kent to get more but it was .8 miles away for a round trip of 1.6 miles and we decided to forgo those extra miles. In the afternoon we again hiked upward for what seemed an endless amount of time. Several times I had to stop and rest just to get my heart rate down. It’s easy to say just drink lots of water but I’m pretty sure I was sweating it out quicker than I could drink it in. The mountain portion of the day ended with a truly wicked descent. It was so steep and rocky that volunteers and some professional trail builders have built a series of 95 steps down this mountain. 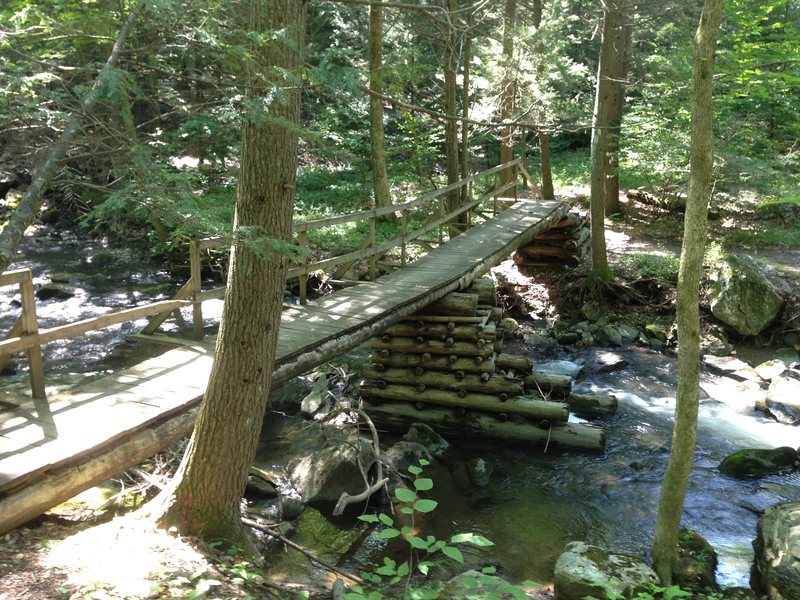 These are not steps in the sense of a stairway, they are rocks that allow the hiker to go from one to another. Brendan bounded down these like a big family dog just happy to have the challenge and once again I was quaking and fatigued as I carefully picked my way down this precipice. This was the sort of “steps” we had to descend…90 of them! This was a knee-jamming–and in my case–heart pounding half an hour! …but this was the alternative! At the 8 mile mark for the day we finally got to enjoy a long gentle level path along the bank of the Housatonic River. We got to the Stewart Hollow Lean-To and discovered that a group of locals had staked out the shelter and appeared to be settling in for a night of partying. They cannot have come from too far away because they had a case of beer and several large bottles of liquor. All I could think was how heavy that beer would be to carry! We opted for tents in the campsite and probably would have done that anyway due to the bugs. We began our routine, set up tents, get dinner started, get water from the brook, clean up, get organized, enjoy a quick bourbon toast and eat. Barley Chili with beef jerky, Pecorino cheese, served over white rice. Dinner that night was Barley Chili. We served it with some beef jerky, chili peppers, and Pecorino cheese over white rice and for the first and only time almost couldn’t finish all the food! By the way, here’s a tip. 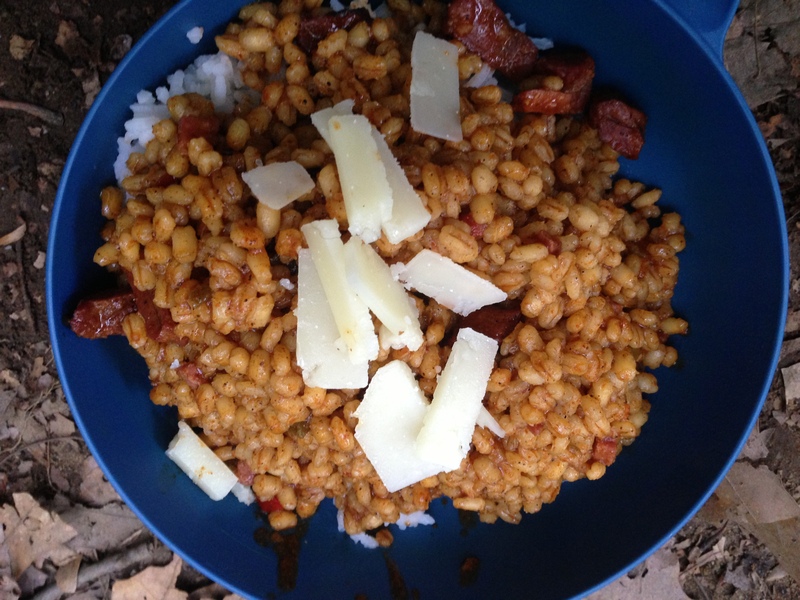 When you feast on Barley Chili for dinner, you want to be in the front on the next day’s hike! 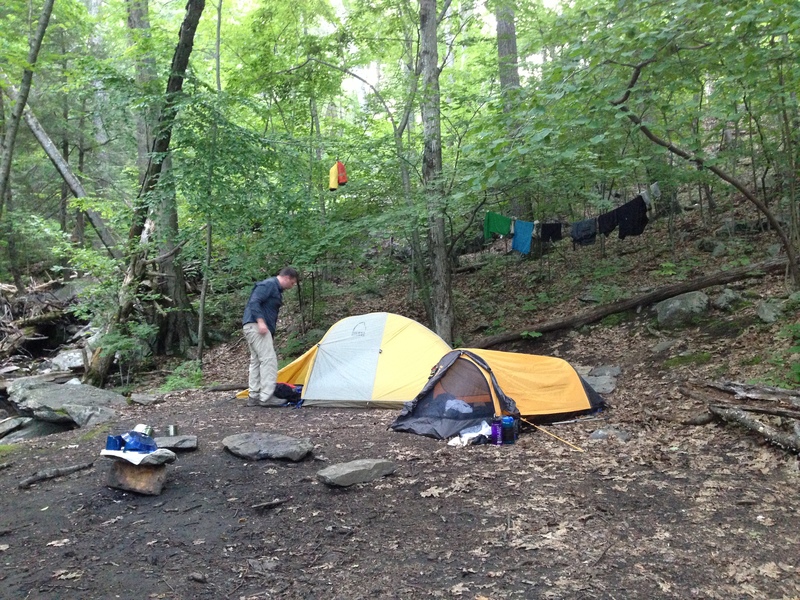 As we were preparing dinner, another hiker joined us and asked if we minded him setting up in our campsite. He too recognized the makings of an all-nighter back at the shelter and needed a good night’s sleep. 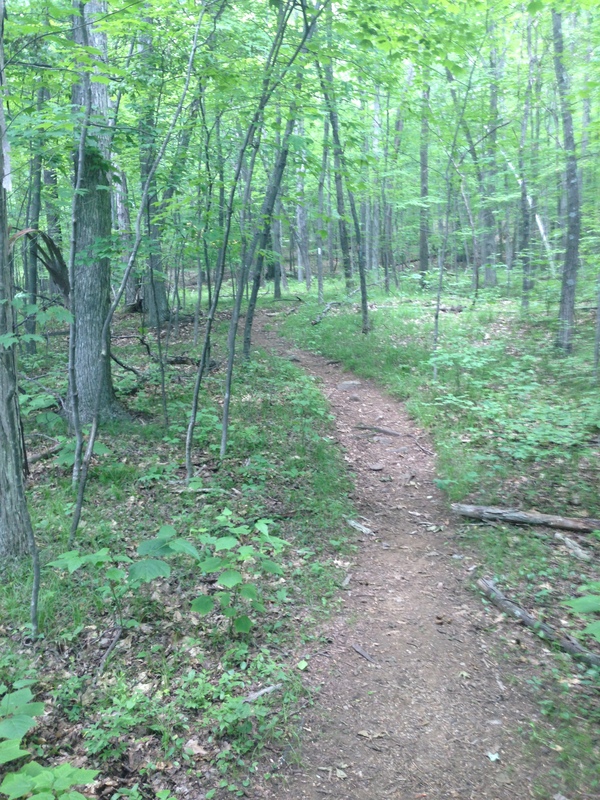 He introduced himself by his trail name “Magua”. Magua is the villain in James Fenimore Cooper’s Last of the Mohicans. In books and movies he is portrayed as fierce, intimidating, and cold. This guy looked and sounded like a 6’6″ Ray Romano! We chatted a bit and traded tales of the day, discussed how far we would go the next day and talked about food. He was doing a much larger section hike than us, starting at the Delaware/New Jersey line and trying to make it to New Hampshire. He was a school teacher and school had just let out. He had one month and was making the most of it. The next day Magua was up and out earlier than us. We had a routine and we usually left camp around 8:00. The day began with a nice 2 miles of level hiking but that quickly ended. 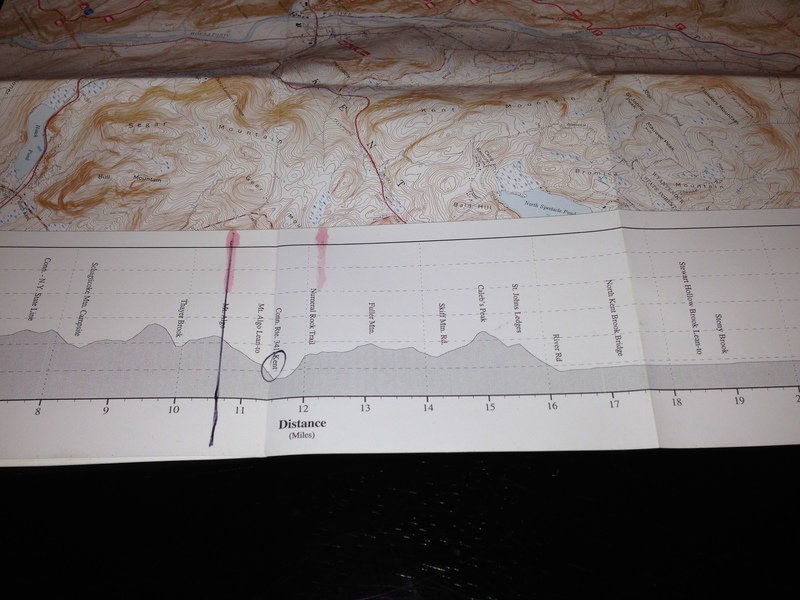 The climb was once again brutal. It was compounded by the fact that the 10 mile mark for the day was a shelter called “Pine Swamp Shelter” and surprise surprise, the mosquitoes were rumored to be legendary. Thus, we decided in the morning to hike 12 miles instead of 10 to get past that. At Cornwall Bridge we decided to hike the half mile into town to a gas station and get some bug spray. As we approached the gas station, there was Magua! He asked if he could hike with us for the afternoon and we gladly accepted. The addition of a third person helped make the time go by as we asked questions and learned about each other. My neighbor in Arlington, VA told me of his wife’s cousin who owned a liquor store in Cornwall Bridge and would give us a couple of free beers. I thought this was a privileged hook-up trading on a family connection but it turns out the Cornwall Package Store offers a free beer to all hikers! It was 11:00 am and a beer was the last thing we needed so we decided on Gatorade instead of the beer and that remains one of the best decisions I have ever made. I wish I’d filled my water bottles with it because it really restored me (along with a Snickers Ice Cream bar!). The gas station where we bought the Gatorade was out of bug spray; but, it was here that we experienced our first “trail magic”. A guy pulled up with a small fishing boat on a trailer and we asked him if there was anywhere we could walk to buy bug spray and he said no, the closest place was more than a couple miles away. Then he dug through his tackle box in the boat and threw us his bottle of bug spray! The kindness of strangers. 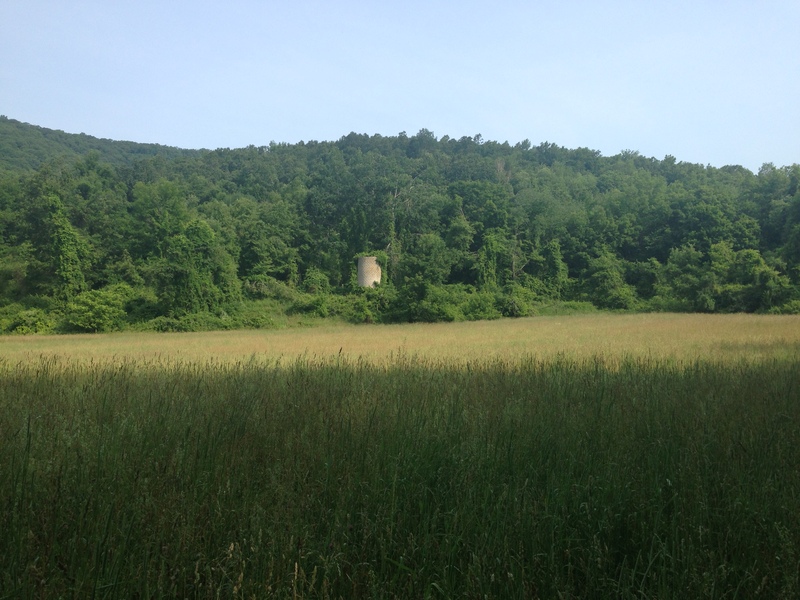 Despite the physical challenges, the hike covered some really beautiful territory such as this old farm field and stone silo. As we hiked, Magua told us that he was availing himself of a place known as a “Bunk & Dine”. The only one of its kind, this place would pick up hikers from the trail, and for $50, give them dinner, a shower, laundry, a bed, breakfast and then return them to the trail. I thought this sounded pretty good, but on a six day trip seemed a little unnecessary. Magua would, in fact, avail himself of three nights of their service, each day going out without his pack and hiking 17 miles! Many of the through-hikers look down on that with the derisive name, “slack-packing” but we spent the night in a mosquito-infested camp and the next day Magua overtook us on the trail looking fresh and vigorous! After bidding Magua farewell to be picked up for his luxurious evening, we hiked on, making it to the 10 mile mark, the Pine Swamp Shelter. This is a rare highland swamp, fed by the glacial waters of the Housatonic Highlands, hundreds of feet above see level. We stopped there for a break and met a volunteer with the Appalachian Mountain Club called a Ridge Runner. 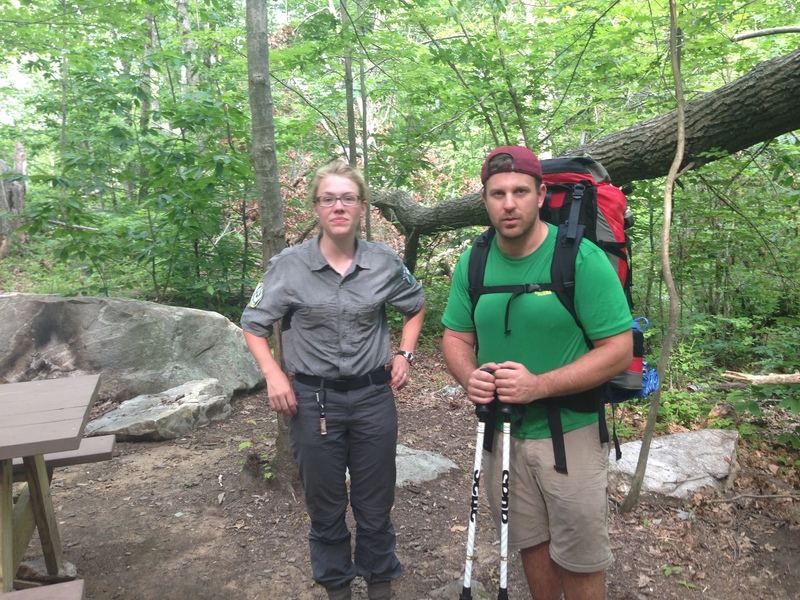 Leanne Holland is a graduate student working on her PhD at Columbia but in the summer lives on the trail and swings an ax to clear away windblown trees. She was also an ambassador of the trail. We had hardly seen a female for four days and here was this capable, intelligent and adorable trail angel just chatting with hikers and making sure everyone was having a good time! Ridge Runner Leanne Holland with Brendan (“Wet Whistle”). She was out there clearing away blown down trees and making sure everyone was enjoying the trail. Leanne was an unexpected bright spot in a long difficult day! She warned us of Timber Rattlers on an upcoming rocky outcrop and cautioned that the bugs at our site 2 miles up the trail would be no better for mosquitoes than the Pine Swamp. Nevertheless, we were committed to that 12 mile day. We pulled into the Sharon Mountain Campsite around 6:30. We were not rushed but we did have to get our routine going before the sun went down. 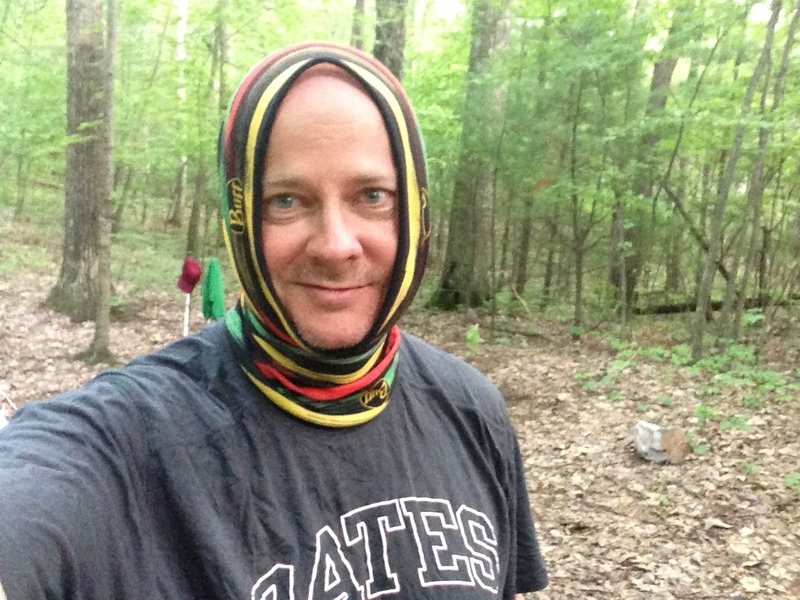 The bugs were indeed so fierce I had to resort to wearing my buff over my head and neck to ward them off. 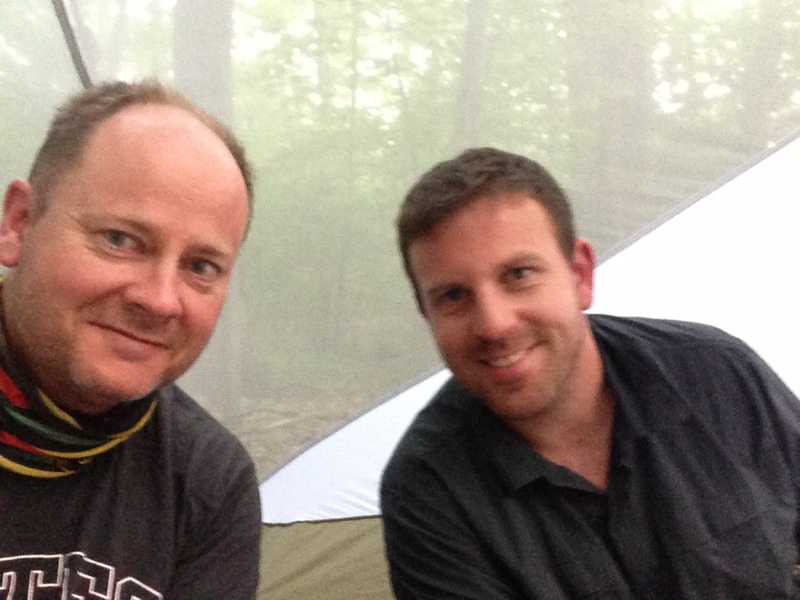 On this night the bugs were so thick and aggressive that we had to eat dinner in Brendan’s tent, which accommodated two people. Dinner that night was Red Quinoa cooked in Fajita seasoning and topped with Albacore tuna and lemon juice. Quinoa is a fantastic food and quite restorative. It is a great source of protein, long-term carbs, and it has a great texture. The bugs were so aggressive that protection from them trumped looking ridiculous! We ate, prepared for the next day, and watched a beautiful sunset before diving into the safety of our bug-proof tents. 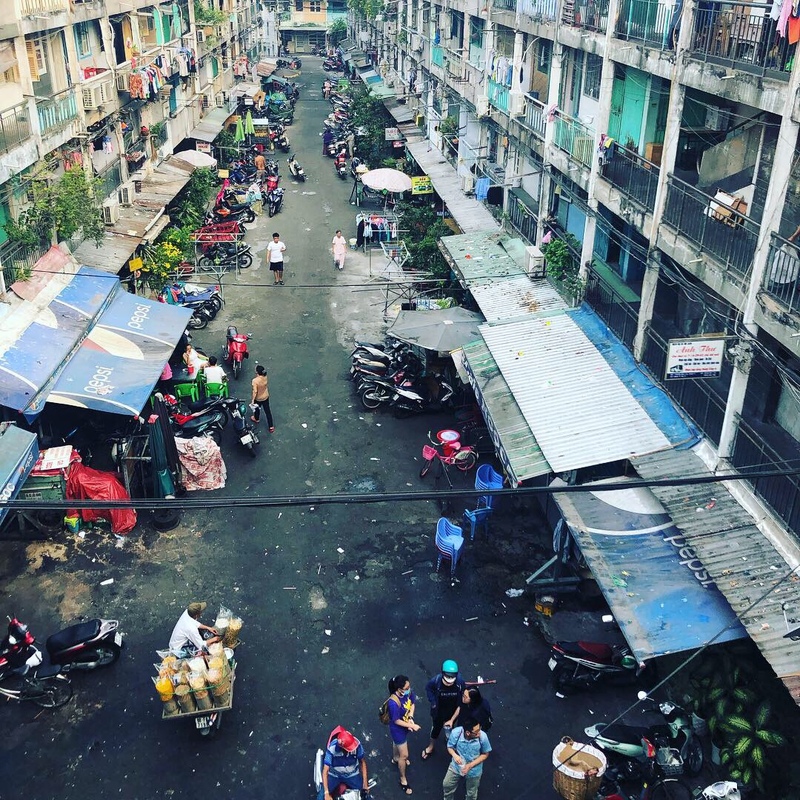 From our respective tents, we talked about our schedule and decided that we needed to reach the Massachusetts state line by Monday night because we could only take one more night of this malarial environment. It was easy enough to do, 10 miles Sunday and 12 miles Monday. That’s when it hit me, it was Saturday night, the second longest day of the year, and I was lying in a tomb-sized tent zipped off from the bugs waiting for the sun to go down so I could go to sleep, sore, and filthy. Yeah, two more days would be enough! Thanks Mom! We saw snakes but I don’t think they were rattlers. 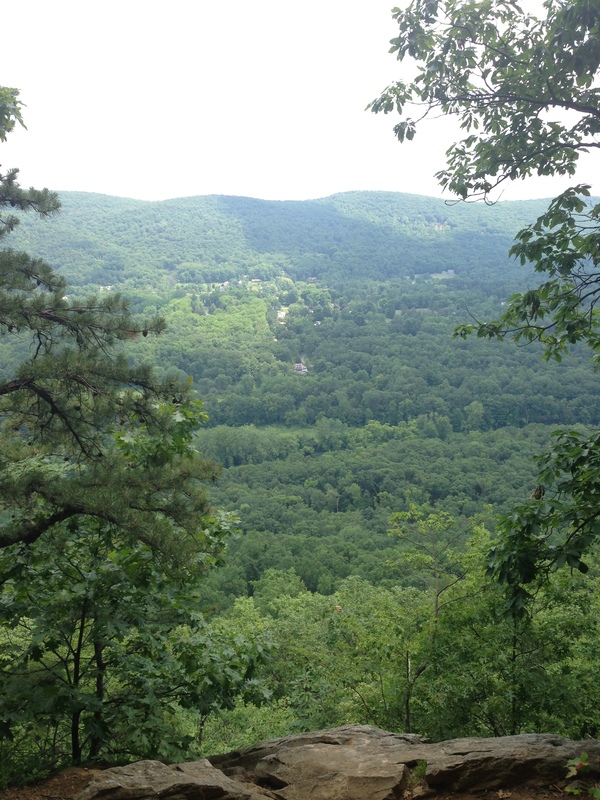 Thanks for the virtual hike on the AT! Beautifully written and illustrated. I really enjoyed reading it. I am loving your travelogue, Tony. Takes me back to my Girl Scout days, hiking the AT in southern PA. Your equipment and reasonable pace make it sound so much more appealing than back in the day! Thank you Carol! The reasonable daily mileage goal definitely made the trip better. The previous year we overdid it. And it’s true the technology in today’s gear makes life much better. That said, being 40 years older than scouting days works against me! Magua! Thanks for reading! Good to hear from you and glad you checked in. How far did you make it?